FRANKLIN — Noted furniture maker Alf Sharp, of Woodbury, will speak about his career path to furniture making and fine woodworking at the free educational program of the Arts Council of Williamson County (ACWC), “Art: Up Close & Personal,” Monday, February 13, 2012, from 6 to 7:30 p.m. in the Williamson County Public Library. The lecture series is free and open to the public. Light refreshments will be served. The main branch of the Williamson County Public Library is located at 1314 Columbia Avenue in Franklin. For more information about the event or the Arts Council, visit http://www.artscouncilwc.org or call (615) 428-3845. Sharp began his journey toward furniture making after attending Vanderbilt University Law School, and realizing that "none of the white-collar professions were appealing." Little did he know that a simple remodeling project for his landlord in lieu of rent would lead to the career of a lifetime in fine woodworking. Even though he had no experience in carpentry, his customer was satisfied, and as one job after another came along, he gravitated toward interior trim and simple cabinetry. He loved making things with his hands and out of wood! As he began exploring how to make fine furniture, he found very few remaining who could pass on the knowledge and techniques of fine hand woodworking. Since it was almost a lost art, Sharp read books and experimented. 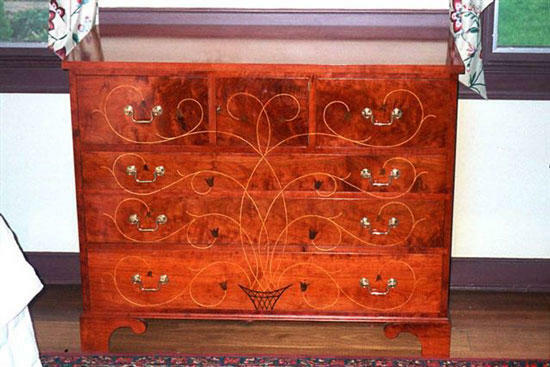 He discovered that "perhaps the finest furniture ever built, both in terms of artistic style and technical skill, was created in the 18th century, "when power equipment of any sort had not been invented and a piece was made entirely with hand tools. Sharp visited prominent museums and collections and picked the brains of collectors, dealers and scholars in antique furniture. At the same time, to make a living, Sharp was growing his business in an entirely opposite direction. "By 1980, he had a 13.500 sq. ft. shop, a quarter-million dollars' worth of machinery and 25 production employees, cranking out fairly low-end furniture." By this time, he rarely touched a piece of wood, and commissions for fine furniture were rare. At the first opportunity, Sharp sold the factory and built a small woodworking shop next to his home in Woodbury, Tenn. He was determined "to use primarily original-period hand tools, large enough only to allow a maximum of two assistants." Since that time, he has concentrated on museum-quality, one-of-a-kind furniture, primarily in the 18th century American style. He also creates 19th and 20th century historical styles, and designs and builds pieces that merge traditional values and proportions with contemporary idioms and exotic woods. Sharp's impressive commissions include dining chairs, mantle pieces, carved Venetian blinds, faux-grained exterior doors, "Jackson" presses, and a replica of President George Washington's swiveling mahogany office chair at the Hermitage; a reinterpreted "Jackson" press and an oak bench using "treaty oak" lumber at the Tennessee State Museum; Windsor dining chairs and Baltimore-style painted settees at Travelers Rest; walnut "Gentleman's " chairs, the Speaker of the Senate's podium and Rococo Revival style Supreme Court Justice's chairs at the Tennessee State Capitol; and many more pieces in public and private homes and offices from Massachusetts to California. He captured Best of Tennessee, 2002, at the Tennessee Artist Craftsman Association, in Chattanooga; and participated in the Wilson Art Exhibition in Philadelphia, Pa.; "Art of Tennessee" 2003 at the Tennessee State Museum in Nashville; "Curvitures," sponsored by the Furniture Society, 2004-2005; "Out of the Woods," The Parthenon, Nashville, 2004; Gordon Jewish Community Center, Nashville, 2006; "Arms, Legs, Feet, Heart & Soul," Tennessee State Museum, 2009; Knoxville Museum of Art, 2009; and Contemporary Classics—Selections from the Society for American Period Furniture, Savannah, Ga., 2006. He was an invited artist to the Master Woodworkers Show in Knoxville, Tenn., in 2005, 2007, 2009 and 2011. His work has been featured in the cover article of Woodshop News, November 2006, and the cover of the book, Studio Furniture—Today's Leading Woodworkers. Publications featuring his work include Colonial Homes, Antiques Magazine, Southern Living, Architecture of the Old South, Fine Woodwork, Woodwork, Custom Woodworking, and various books. Sharp has served as an instructor on the "History of Furniture" and "Architectural Detailing" at O'More College of Art and Design in Franklin; instructor at Marc Adams School of Woodworking, instructor at the Connecticut Valley School of Woodworking; and instructor at the Center for Furniture Craftsmanship in Rockport, Maine. Active in the profession, he is serving as president of The Furniture Society for 2011 to 2012, and on its Board of Trust from 2006 to 2013. He also has been president of the Cumberland Furniture Guild since 2002, is vice president since 2009 of the Board of Directors of the Tennessee Association of Craft Artists, and served on the Board of Directors of the Cannon County Art Center. This series is underwritten in part by The Arts Build Communities program, which is funded by the Tennessee General Assembly and administered in cooperation with the Tennessee Arts Commission and The Community Foundation of Middle Tennessee. Scott B. Hodes, director of visual arts for the Arts Council of Williamson County, has asked the guest speakers to share the experiences that have culminated in that person becoming a working artist in the community, such as background, history, choices and decisions, education and technique, work experience, and artistic and life influences. The Arts Council of Williamson County (ACWC), a nonprofit 501(c)(3) service organization, is a catalyst for the enrichment of cultural life in the county by funding, promoting and expanding the arts.